Modern kitchens have so much technology, one has to wonder sometimes how people lived without all this cookware – yet they did. These sleek and sharp-looking stainless-steel knives are an attempt to go back to a simpler, less-cluttered kitchen without compromising contemporary conveniences to which we have become accustomed. 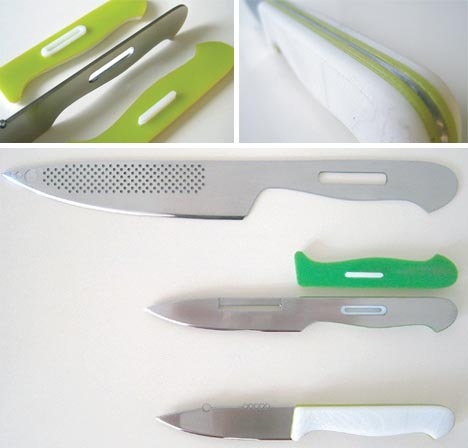 Using the flat of the blade and/or the handle, each part of this three-piece set serves at least a second (if not a third) additional function – thus reducing the need for other conventional kitchenware. 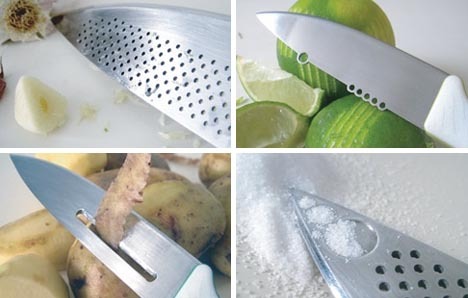 The six-inch knife includes a grater/crusher and herb-scooper; its four-inch sibling doubles as a vegetable peeler. The smallest in the set is a short three-and-a-half inch piece with a ‘decorating’ tool built into it. 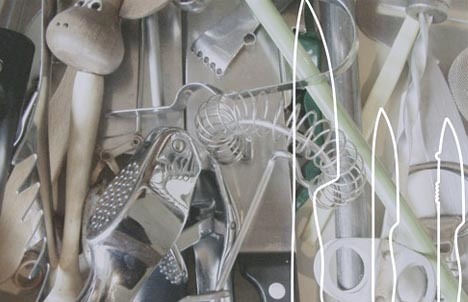 This BasicKnives project from Caroline Noordijk was part of a collaborative project between the RCA and BrAun to explore beyond-traditional ideas for simplifying kitchen cutlery design and enhancing the cooking experience with multi-functional chef tools and without compromising high-quality materials. Simple but rather ingenious, this knife set saves you space, materials, cost as well as the time it takes to flip between various implements.